Prevention is the foundation of dental care. And at Noble Dental we focus on providing preventive dentistry. Our hygiene team provides the best in routine hygiene preventive dental care. There are three diseases that negatively affect our teeth: decay (cavities), periodontal disease (gum disease), and occlusal disease (destruction of teeth). At Noble Dental we screen all our patients for their individual risk for each of these diseases and create a specialized approach for maintaining each disease or keeping you disease free. Dental decay or cavities is the most common of these diseases. At Noble Dental we provide routine dental hygiene appointments to help keep you cavity free. During those hygiene appointments our doctors will diagnose decay through a dental exam and digital radiographs. 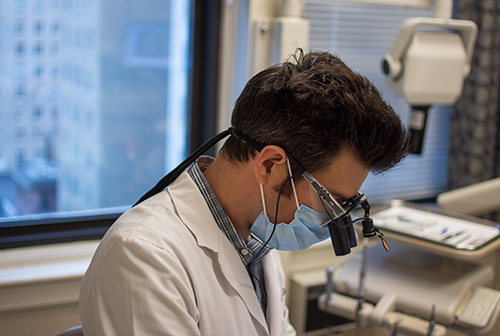 Patients with regular appointments help us detect decay early where it can be treated as minimally invasive as possible. Having regular dental hygiene appointments, allows our dental hygiene team to discuss and demonstrate proper oral hygiene tips and discuss which products that will most benefit you for maintaining a healthy and cavity free mouth. Periodontal disease or periodontitis is a chronic disease where there is chronic inflammation in the tissues and bone that support your teeth. Our dental hygiene team is able to help you prevent gingivitis from progressing into periodontitis or if you already have been told you have periodontitis we can help you maintain your teeth with our Early Periodontal Treatment. Occlusal disease is usually a slow progression of damage due to the pathological pushing of the teeth against each other, or excessive tooth wear or force. Often times pain may not be experienced due to our bodies ability to adapt until something is so damaged or broken where it is difficult to bring it back to health. The effects of occlusal disease include wear, sensitivity, cracks, loose teeth, breaking teeth, sore muscles, painful jaw joints, headaches, acid reflux, breathing disorders, and sleep apnea – these and more can be associated with occlusal disease. At Noble Dental we make sure to catch these signs and symptoms early and apply preventive treatment such as a night guard to help reduce symptoms or slow down occlusal disease progression. At Noble Dental we know each one of our patient has different needs and we strive to ensure that we provide you with proper diagnosis and treatment to help you maintain good oral health.